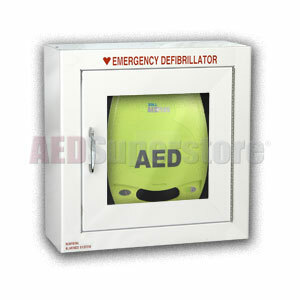 ZOLL® AED Plus® Standard Size Cabinet without Audible Alarm or Strobe Light. This cabinet contains a bracket exclusively for use of the ZOLL AED Plus model defibrillator. Purchased this cabinet to hold an AED in my business office. First impressions are that it is a well constructed item at a reasonable price. No accessories, i.e. bells, lights or whistles ordered.